This outfit screams halloween favorite! 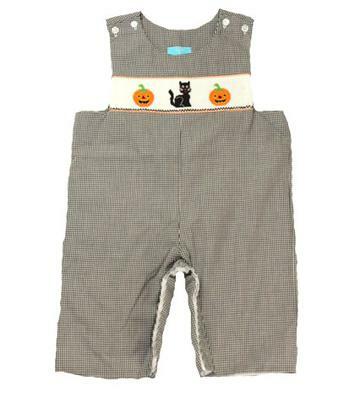 The white and black checkered long romper is handsmocked around the chest with two pumpkins and one black cat in the middle. There is two buttons on each shoulder and snaps all along the inside of the legs to easily change a diaper. This adorable romper is 100% cotton.